Forum River Center is a wonderful venue to host Concerts, Sporting Events, Conventions, Ceremonies & Weddings. 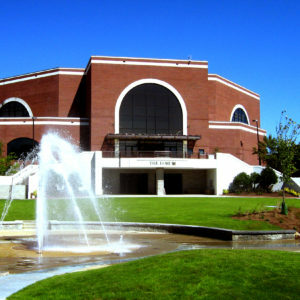 The Forum River Center is located on the banks of the Oostanaula River, in the heart of downtown Rome, Georgia. 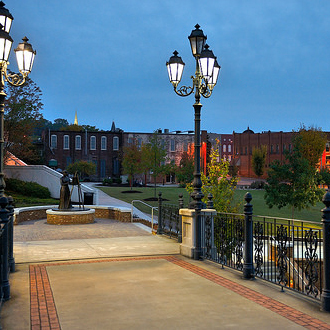 Nestled in the foothills of the Appalachian mountains, Rome was named the #1 Small City in the Southeast. It is located 70 miles from Atlanta and Chattanooga and 120 miles from Birmingham and is beautiful destination with unique shops, outdoor adventures, well known hotels, and exciting nightlife. The venue is in the final stages of a $1.4 million dollar renovation and has established itself as the largest and most flexible premier event facility in North GA. It is home to many annual events such as high school & college graduations as well as various speciality events such as bull rides, concerts, conventions, sporting events, and weddings. The Forum River Center opens onto the Town Green, and the relatively new Chief John Ross Memorial Pedestrian Bridge connects it to the West Third Street corridor on the other side of the Oostanaula River. The venue is owned by Floyd County who awarded Atlanta based agency, Safari Hospitality Management the operating contract to oversee the renovation due for completion late summer 2017. Safari Hospitality’s mission is to provide extraordinary experiences and leave lasting impressions. Our team consists of a full staff of creative and professional leaders ready to show you all that Forum River Center has to offer. Through our simple mission we imagine, create, and deliver excellence in every detail. 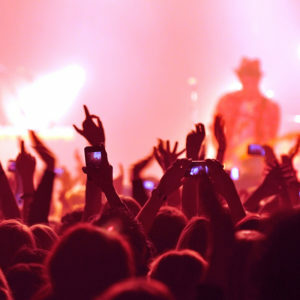 Whether you are a promoter looking for a venue to host your event, a bride planning your dream wedding, a music lover coming to enjoy a concert, an exhibitor participating in a tradeshow, a business needing to rent a boardroom, or a visitor enjoying a special event, we aim to exceed expectations with creative and personalized service. The Rome News Tribune opened their annual Best Of Rome voting polls on August 27, 2017 and closed them on September 1st. A red carpet event was held at the Hawthorne Suites on November 9th to recognize and celebrate all of the winners of the 10th Annual Best Of Rome. 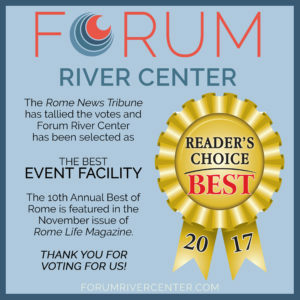 The Best Of Rome issue of Rome Life Magazine is now available and Safari Hospitality is excited to announce that Forum River Center was chosen as Rome's Best Event Facility! 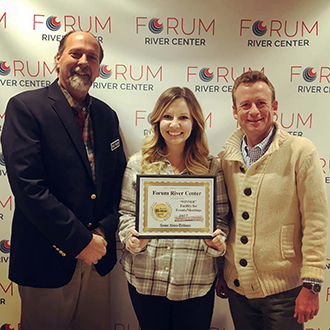 Safari Hospitality has managed Forum River Center for Floyd County since July 2016 overseeing a $1.4 million dollar renovation with plans for continued upgrades. The venue has now established itself as the largest and most flexible premier event facility in Northwest GA.
SHM could not have won this prestigious award without our team of creative and professional leaders. Come let us show you all that the new Forum River Center has to offer! Great experience and helpful people! Had a very small town feel for such a big center. Absolutely FANTASTIC! Great venue, super supportive staff, excellent catering, absolutely enjoyed it! Thanks for everything you did to make last nights award ceremony event awesome! It was absolutely beautiful. You are very good at what you do.